Check Out A Leaked Teaser Clip From Donald Glover's Super Secret Film With Rihanna (VIDEO) - T.V.S.T. If you’re a Donald Glover fan, you might have heard rumors about some project titled Guava Island. The project has been talked about for several months, but no one really knows anything about it. Well, now we have a little more information. 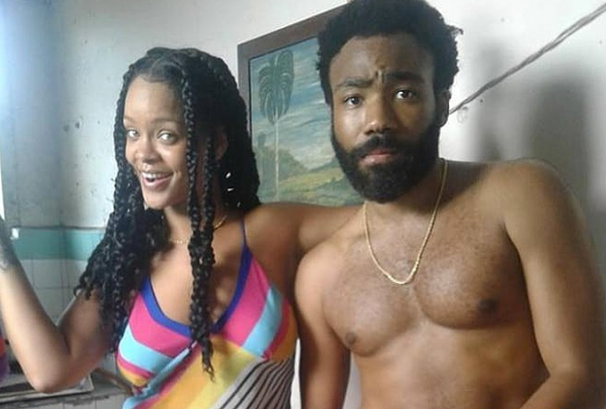 During his PHAROS Festival in New Zealand, Glover surprised fans with a little clip/trailer from the upcoming film, which co-stars Rihanna and Letitia Wright. The quality of this clip is poor because it was filmed on someone’s phone, but be grateful you even have this much! It looks like Rihanna and Glover have some real chemistry on the big screen. This film was directed by Hiro Murai, who helped Glover create the music video for ‘This is America,’ so hopefully this movie is as unique as the video. No word on a release date, but we will keep you posted. Now that this clip has been leaked, it doesn’t make sense to keep the project a secret anymore. Shawn Mendes Is NOT Gay And He Wants Everyone to Know It! Alicia Silverstone Is Having To Pay Her Ex Husband HOW MUCH In Spousal Support? We Got The Numbers Inside!